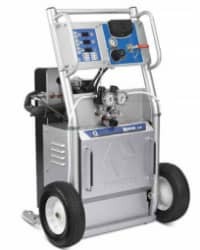 Fast-Set Spray Equipment for Sale - Custom Spray Equipment | Spray Quip, Inc. When you are dealing with fast-set or quick-set insulation, certain requirements are necessary from your applicator or dispensing equipment. At Spray-Quip, we design, build and commission fast-set applicators, as well as dispensing equipment for all of your insulation applications that use fast-set spray on insulation. We carry a complete line of fast set spray foam application guns including Fusion AP, Fusion AP Automatic, GAP Pro, and P2 Elite Air Purge guns, Fusion CS Chemical Purge guns, Fusion MP, Fusion MP Automatic, GX-7 and D Mechanical Purge guns, EP, AR, GX-10 and AR-C/D Pour guns, along with custom built nozzles, mixers and adapters. Which Fast-Set configuration is best for you? 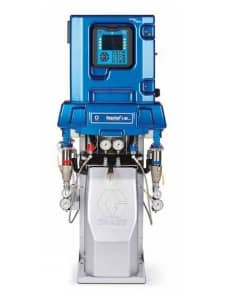 Contact our expert staff today with any questions on all of our dispensing equipment for spray foam insulation. We carry and custom create everything from complete self-contained trailer systems to in-plant, integrated systems featuring: Graco Reactor - E-10, A-20, E-20, E-30, H-25, H-40, H-50; Graco Triton - T1, T2; Guardian - A-5 & A-6; and Husky and IPM material supply feed pumps for drums or bulk containers. 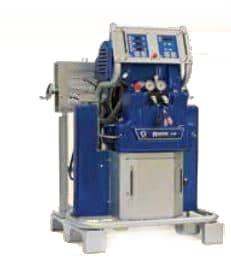 We also have custom fabricated Spray-Quip proportioning equipment available, with a focus on supplying standard off-the-shelf components that are easily serviceable.